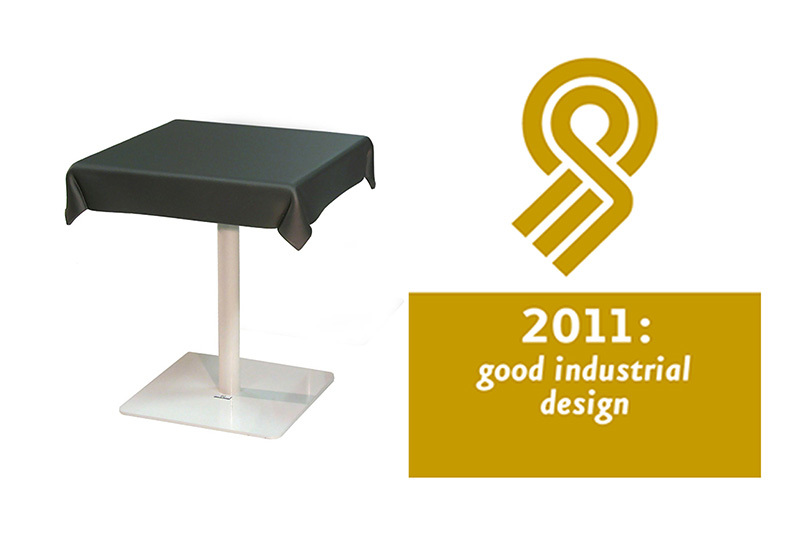 Clothtable with unique rubberised soft coat tabletop was awarded with the Good Industrial Design recognition GIO 2011, at the Dutch Design Week on 25 October 2011. This table is a completely new design and has no comparison in the market. It is unique but instantly familiar. A table with a tabletop in the shape of a tablecloth that is flexible and has a very soft touch. This design has brought a big smile on the face of everyone who has seen and felt it. To be used indoors as well as outdoors. The Clothtable is now available in any RAL colour to match with any chair, any interior or any exterior. In different sizes it can be used as a bistro table, lounge table, restaurant table etc. Suited for restaurants, bars, terraces, offices, libraries, museums, healthcare, resorts etc. Materials: Tabletop in rubberised soft coat foam in any RAL colour. Most ordered sizes: 65 x 65 x 75 cm, 60 x 60 x 75 cm and round 50 x 75 cm. Leg in steel in the standard colours RAL 9010 (white) and RAL 9007 (grey aluminium), other colours on request. Contract market: Inquire about the numerous possibilities regarding sizes, RAL colours, embossed logos, round versions etc. High or low pedestals etc. Loose tops are available for installation on your existing pedestals.